As a culinary teacher it’s so hard to narrow down your hundreds of class ideas into two classes. I usually teach four or so, but with the winter weather conditions, (I know what your thinking?) we are limited since we are an outdoor facility. When it’s time to develop my classes, I spend days deciding what to teach. Do people want how-to classes, entertaining classes, gluten-free, raw…and the list goes on. I’m only one person trying to change the way people eat one day at a time! To sign up for my classes just glance over to the far column and click on the calendar for the class listing and tickets in February! So, I decided I’ll teach my passion. Greek and Plant-Based. 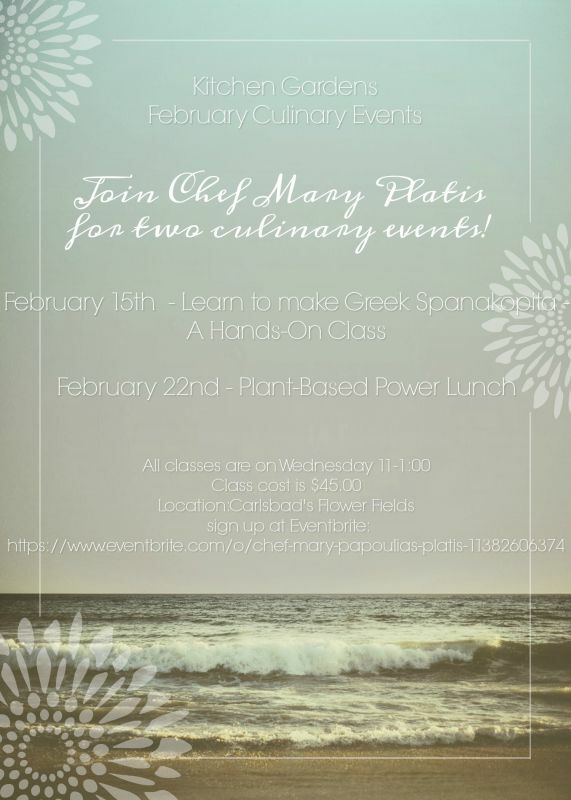 February 15th – Hands-On class on making “Spanakopita”, Greek spinach and pie . February 22nd – Jumpstart your health with a Plant-Powered Lunch ! I hope you will come and join me in a class or two this season. My most popular classes are my more California health driven menus. I am branching out to new hands-on classes, more informational, as well as more nutritional dishes. Happy New Year to all my followers, and I hope the year brings you much health and a hearty appetite! Also you may follow me on my Facebook page for : Kitchen Gardens in Carlsbad for Updates and Information!